After touring the world, the walk to the grocery store was hardly an adventure. She sighed a thousand times during the ten minute walk. It was boring. It was cold. It was excruciatingly painful. “Haven’t seen you in a while,” the man behind the counter said, flashing his perfect white teeth. “World travel. Haven’t you heard?” she snapped at him. He looked hurt. “I was just making small talk,” he muttered. The man remained silent, as he counted the items. His name was Finnian, she vaguely recalled. She was quick to pay the cashier and almost run out of the shop. But as she did, a drop of rain fell on her nose. Great, she thought. To go home in the rain. It wasn’t irony. She loved the rain. She twiled and skipped almost halfway to her home, when she was interrupted in her moment of solitary joy. She tuned towards the voice. A familiar face was looking at her; under the hood of a raincoat. Her heart gave a jolt. “You’re going to catch a cold,” he said, in that same matter-of-fact tone in his voice. “Cold?” she asked, mirroring their first conversation. “I know what cold means,” said she. They stood silently, surveying each other. She followed him as he led them to the lake. Weeping willows, she thought. They were astoundingly beautiful. Each willow bent over the lake, their leaves dropping moisture. He clasped her hand and pulled her along towards one of them. She smiled. She had missed this. When they had reached their favourite willow–favourite because the leaves hid them from view–he pushed her gently against the trunk. He pulled back his hood. “I have been hearing rumours,” she said softly. He didn’t respond, so she gave a nervous laugh. She didn’t know how to proceed. “Do you believe in these rumours?” He asked, putting his arms around her waist, like he didn’t want to let go. “No. I have had tons of encounters with them–” His eyes widened. “–And I don’t think . . you could pass their interview,” she said, reusing an old joke. He laughed and she laughed with him. But both their voices had an edge to it. He suddenly leaned forward, their noses almost touching. The grocery bad slipped from her fingers. “Do you . . . trust me?” He cleared his throat. “Even though . . . nobody else does?” his voice cracked. She nodded. 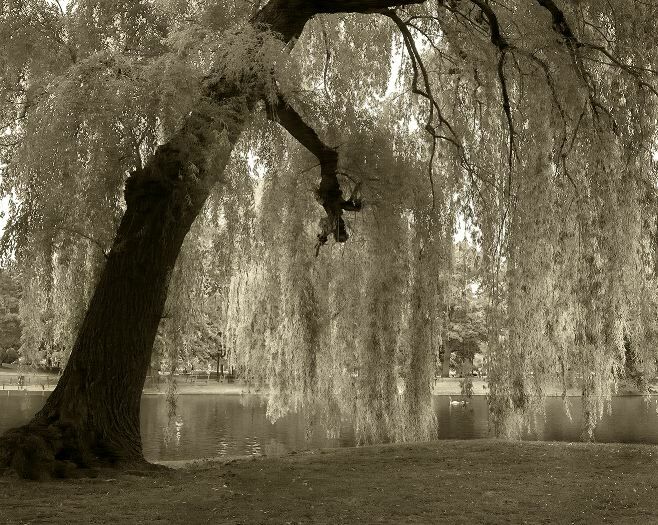 The wind picked up, and the leaves of the weeping willow lashed all around them. He stepped closer, his body touching hers. They were both breathing heavily. She thought she saw a strange hunger in his eyes–one which she had never noticed before–but she ignored it. She threw her arms around his neck and pulled him closer. The wind howled and it started to rain hail. The first of the sudden lightening came. The warmth of the kiss spread throughout her, and she felt her toes tingle. his arms around her tightened, and she wanted to say him to loosen up, loosen up and let her breath. But she couldn’t breath, and she wanted to gasp for air, but he had her lips doing something else. He pressed closer and flattened her across the bark and she felt constricted. She wanted to tell him to let go, but she couldn’t breath, and now he was pressing her neck. And when he did let go, she was already fading. They found her the next morning under a willow tree, missing her blood and her lips. It reminded me of the stories I used to write back in 07′. It has such an anime feel to it – could play it in my head. That was the whole point of the story. That you could play it in your head. And I didn’t even realise about the anime part. I really wasn’t thinking of Anime. But I think if the bug bites, the mark never goes away. ooo, thanks! I’m so happy it came out as I expected.